One thing that I love to do with my children is read books. Not only does it help them with their reading and vocabulary skills but also gives us a special time together. This special time together also becomes lifelong memories that they will have of me and them together. Lately I have been getting more books that my older children can practice reading to their siblings. 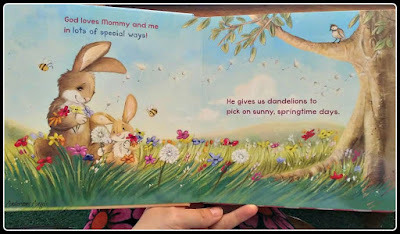 One of my newest and favorite books I got recently is "God Loves Mommy & Me". While reading this book I felt like the author had been following me and the kids around lately. Everything in this wonderful little book is a daily thing Angel and I seem to do or go through everyday together. Especially the part about picking dandelions. We go out in our yard daily weather permitting to see what new flowers we can find and she always gathers a bouquet of dandelions for me. I really enjoy reading this book with Angel and Peanut. The older kids have also been reading this book to their younger siblings. I love listening to them read it and talking about how they do "those" things with Mommy. 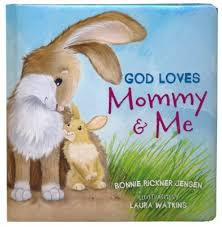 God Loves Mommy and Me is a great book to cuddle up on the couch or in your favorite reading spot with your little ones. The illustrations and story are a great celebration of strong, loving mothers, cherished little ones and the God who loves us all. This book is a board book so you don't have to worry about little hands tearing the pages while you read it together. If you know someone who is expecting or is a Mom I would highly recommend getting them this book to share with their children. 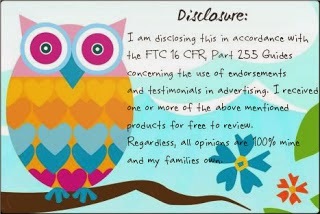 This book would make a Great Mothers Day gift for a new Mom or a Mom with Toddlers.